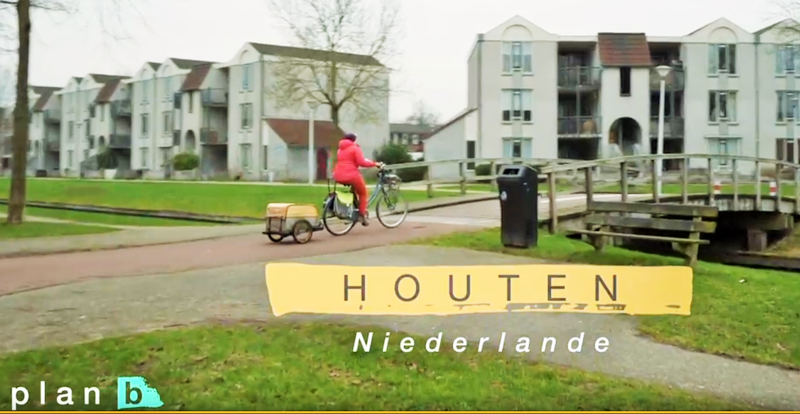 Along with Robert Derks, who’s brain-child Houten is and André Botermans​ (our world representative on all things cycle-town-planning) we got to show how a modern life can work on the bike. We’re still trying to get this subtitled in English, so sorry to those who, like me, have little or no German. If you don’t want to see the whole thing, Utrecht and Houten begin at about 12 mins 30 seconds, with the drone-shots of the yellow bridge. The first man and his dog (on the bridge above all the trucks) developed a system for reducing the amount of empty freight vehicles on the road by linking them up with companies needing deliveries taken in the vehicle’s return direction. If I understand it correctly, it has reduced the amount of freight drastically. The second story is about a family-owned pen manufacturer which has been extremely proactive in reducing the amount of traffic on the roads caused by their own employees. Granddad organised a system when he first established the company and now, his grandchildren offer electric bikes with subsidies and incentivising activities as well as large and small buses which allow the company to adapt to different employee travel-needs throughout the year. In Houten we talk about the cycling life and why it brought us here, we meet Robert Derks (over the maps) and he explains the driving ideas behind the development of Houten (and yes, that was an absolute privilege and personal hi-light for me) and we meet Andre Botermans as he explains life in Houten and some of the infrastructure we live with daily. In Utrecht you meet the Councillor Lot van Hooijdonk as she shows plans for how to reduce car traffic. We also visit the spectacular new cycling storage-unit at the train station with current space for 6000 bikes and the building site that will soon house another 6000. And seriously, you don’t get to see as much as we filmed, but it’s such a gorgeous building you could easily be forgiven for thinking you were in the new extension of the Tate Modern London or some brutalist theatre in any of the world’s capitals! The old footage shows where a canal was removed in the ’60s for car traffic and how that decision has now been reversed. Where I meet Franse, the cycling teacher dressed in blue, that water is the newly re-instated canal. We also ride to the Daphne Schipers bridge, which is a stunning piece of architecture, then back through some of the older parts of Utrecht. If you would like to read more of Lot van Hooijkdonk, you can do that here. If you cut and paste it into Google Translate, it reads pretty well in computer-generated English and gives a great insight into the ideology driving the developments in Utrecht. With cut and paste into Google Translate you can also learn more about the Cycling Association which Franse belongs to and in particular, the role he plays in teaching beginner cyclists how to manage their new-found wheels. The big drone-shots of me and my red coat cycling through open spaces surrounded by farms and fields, are taken above the cycle path between Houten and Utrecht. Every time I ride that I’m in love with just how gorgeous it is and I have the same conversation with myself about buying a go-pro just so I can film it. Well…definitely don’t need to do that now! This was an excellent project and we loved being part of it.